but watercolor is usually what i associate with that dusty dark gray. i often use india ink or graphite. I use brown rather than gray. I dip a small brush in dark spirit varnish and then pick up some dry earth color and brush the mix onto the edge. I do this before final polish of the varnish so any minor staining of the varnish can be polished off. Nussbaum (Van Dyke crystals in water) - any craquelure adds interest. Nussbaum - any craquelure adds interest. Van Dyke crystals dissolved in water can leave a nice matt brown coating that can crackle varnish if used appropriately over partly dried varnish. I've been using Walnut ink as well. You can dilute it to your desired shade. Do you do this on bare wood or apply some base first? Black tempera leaves a matt finish that has a greyish tinge to it. But I probably will try the Nussbaum next. The contrast between the tempera black and fresh varnish can give a slightly industrial look if viewed close up. I suspect the Nussbaum brown would blend better. Straight on the wood after varnishing. I like to brush it in the f-hole edges and pegbox while applying the ink for craquelure. That way the only part of the instrument that doesn't get covered is the neck. All depends pretty much of the style you are aiming at. Personally I try to avoid pure black because it creates a pretty stark contrast to the surrounding varnish especially if the varnish is yellow. So blending in some brown into the black (or vice versa) makes usually a good blend which looks black but isn't really. 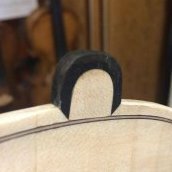 However I have seen violins with f holes which looked like cut with a laser and were stained black at the edge to underline the sharpness. This had some appeal to me. But if f holes don't have a super clean cut, I would avoid pure black. Actually there are some modern Italians which just mess around with some black smear. Marchetti comes to my mind. you mean like shoe polish? Yeah, that's how it looks like. But actually Marchetti and some of his contemporaries didn't get the idea of style and taste. Even if I am risking here to be attacked for saying this: Marchetti is IMHO just a lousy maker. Everything is sandpapered like hell and just to 'stradify' the result he smears on the f hole borders the rib corners and on the scroll chamfer a black sauce presumably made from his varnish with lamp black. Arrrrgh. The real funny thing is that he makes it so individualistically that it is almost like s fingerprint recognition mark. Joe just commented on the use of polishes on FB. It seems Charles B. warns against the use of polishes containing oils for older instruments. Joe adds that some polishes contain wax, causing the same problems for restorations.. and isnt shoe polish mainly wax? I know we are talking about the f holes here, but maybe its better to avoid any waxy substance on violins. I’ve just been using my the varnish that’s going on the rest of the instrument for the f hole and peg box. Nobody has suggested this so I’m wondering that look is not desirable. I have been using sepia watercolor in the pegbox and f-holes. I like it, but I'm open to other things. I thought Jim's looked good with the same varnish used elsewhere on the fiddle. It has been suggested, and used in the past. The ffs and pegboxes on most 17th century instruments currently appear much darker than that, so that's what I do too. Maybe that's my minor concession to "antiquing"? My thoughts were that with no polishing or cleaning these areas would darken up fairly quickly. I’m not sure how quick, quick is, or whether it’s a good assumption. I think this would happen much more slowly today, than in the wood and coal heating era. What do you do on the pegbox? Typically the same on the ff as the pegbox. I use a burnt umber oil tube paint. Something very satisfying about this task of painting. Maybe because you are so close to stringing the instrument at this point in the game. The ff I typically use a liner brush. For pegbox I use the same varnish than the rest of the violin, just a little darker to have some contrast. "For pegbox I use the same varnish than the rest of the violin, just a little darker to have some contrast. For F holes acrylic black paint (opaque), the same that I use for scroll chamfers :"
David, you are a saint for telling us your method.